For the second week in a row, both Toronto Dingo’s teams have chalked up two big wins, both coming at the right end of the season. Div.1 have kept their final’s hopes alive, while Div.2 have added another win and will face off against the Rebels this week in a first v second clash. Div.1 lost forward Wade Edwards and Heath Neville during their match but were able to still kick goals with 10 goal scorers for the day. Here’s more on how both teams went in round eight. 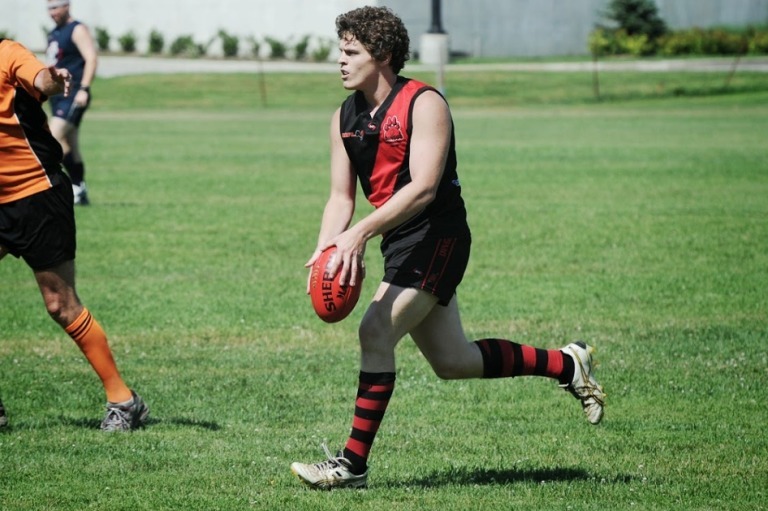 The Toronto Dingos Div 1 side was able to put together back-to-back wins for the first time in 2014 with a solid 65-point victory over the Central Blues this weekend at Humber South. For the Dingos, it was their best team for the year, as they welcomed back five players, including Wade Edwards, Mike Karas, Tom Bell, D-Mac and Tom Evans – all adding skill and strength across the ground – as a 6-pt margin at quarter time quickly blew out to a seven goal lead during the third quarter. The Blues were missing a trio of Aussies – some that have only played once or twice this season – and were unable to match the hardness and delivery of the Div.1 midfield brigade. Alex Aitken, Tom Evans, Geoff Hansen and Mike Ladd, along with Tom Bell in the ruck, got plenty of the wet and greasy ball. Shaun McKay and Mike Karas held the backline together as they kept the Blues to 6 scoring shots all day and two goals. The Blues failed to kick a goal from the 10 minute-mark of the second quarter – their first goal was a kick off the ground from inside the goal square. Wade Edwards had immediate impact and kicked two goals, taking several strong grabs but went off with an ankle injury. Heath Neville then went forward and kicked a goal from a set shot but also went off in the third with a severe cork. The solid all-around effort puts the Dingos into a final's spot with only four weeks left in the season. Dual BOG for the game was awarded to Tom Evans and Tom Bell for their strong work in the middle of the ground all day. Next up for the Dingos are the undefeated Rebels, one of the oldest and proudest clubs in the AFLO and top of the ladder in 2014. The Dingos will need to play hungry, four-quarter footy to knock off the Rebs next week. Goals: W.Edwards, A.Aitken (2), H.Neville, C.Turner-Bloom, T.Evans, T.Moller, J.Robertson, D.Wells, D.Cormier, E.Wells. Best: T.Evans, A.Aitken, T.Bell, S.McKay, M.Karas, D.Wells. The Div.2 Dingos continued their winning ways with a resounding 89-pt win over Central Blues at Humber South on Saturday morning. Div.2 were never challenged as they racked up 30 scoring shots to 6, with Dan Prior leading the way up forward bagging five goals. With the game wrapped up by halftime, Div.2 kept the foot on the accelerator. Rainer Haycraft kicked three goals, ruckman George Craig and Gary Conlon booted two each, with a string of others kicking singles. Captain Alvin Ranchhod was awarded best on ground with Steve Gordon a close second for his contest and defensive work. This week Div.2 take on league leaders Toronto Rebels who are undefeated and have played one more match than the Dingos. Last time these two teams met a few weeks back, the Rebels won by six goals. Div.2 will be looking to upset the Rebels and inflict their first loss of the season in what should be a hard fought affair. Score: Div.2 15.15 (105) def Central Blues 2.4 (16). Goals: D.Prior (5), R.Haycraft (3), G.Craig, G.Conlon (2), T.Moller, S.Gordon, S.Lanning. Best: A.Ranchhod, S.Gordon, G.Craig, R.Haycraft, D. Prior.